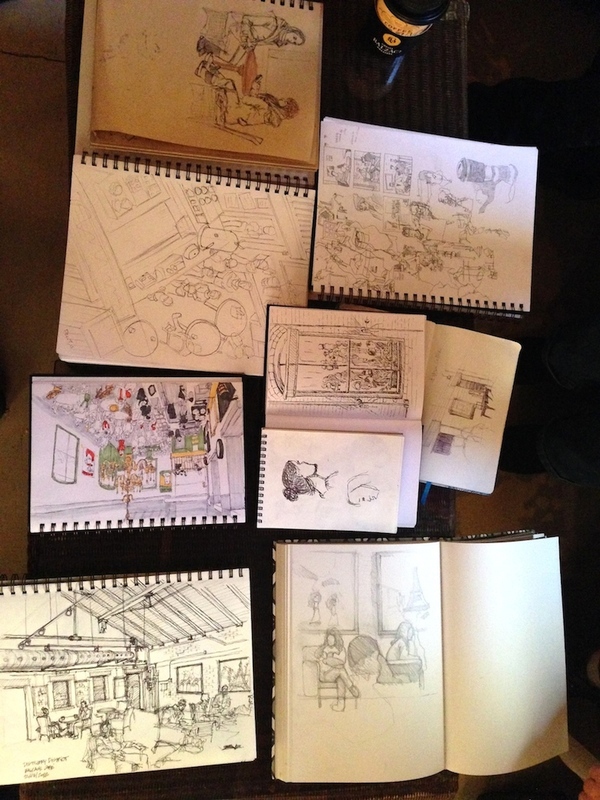 The plan for our 6th meetup was to go sketch the Christmas Market at the Distillery District, but we were so cozy and comfortable at our meeting point, Balzac Coffee Shop , that we decided to stay and sketch there the entire time. Despite the place being packed due to the holiday attractions all ten of us managed to find a nice spot on the second floor. It gave us a great opportunity to get a birds eye view of the space. This coffee shop has a lot of character and interesting vignettes to sketch. I managed to capture various groups of people enjoying a hot drink after waiting in line forever. I felt bad for the staff, they were going non stop. The coffee machine just couldn't keep up with the volume order fast enough. While I was waiting for my drink, I took the opportunity to sketch the sweets on the counter and a portion of the only coffee machine. The staff was moving too fast for me to capture them. It was great to see all the sketches from the other artists. It always amazes me to see the variety of subjects that can come out of a single location.